This post is vintage. Not just because everything in it you see (except for the food) is probably about 60 years old, since we're in our new-old apartment in the parte vieja of San Sebastián. It's vintage too because it harks back to the old days, when I blogged from Birmingham about delicious if random food I made. One of my best friends recently commented that she always pulls from my "old recipes". So here's a throwback post....and one that reflects what we eat on a daily basis at home even when we're here in Basque Country. 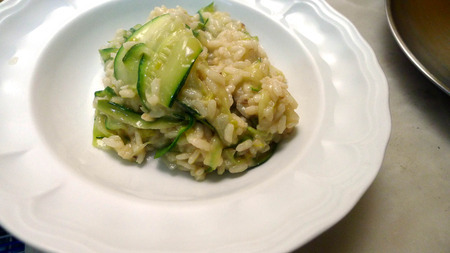 Arborio rice smuggled from Italy, some of the gigantic zucchini from La Bretxa, and risotto skillz from Bottega...all combine to result in a delicious, perfect risotto. Whenever my friends and I have a daily rant about some aspect of gastronomy, one of my favorite blanket statements is "I have never had a great risotto in San Sebastián." Except in my kitchen. Heat some a couple tablespoons of olive oil and butter over high heat. Saute onions and leeks until tender. Add rice and bay leaf, stirring until beginning to be translucent with some pieces toasted. Add wine, stirring until nearly all the liquid has been absorbed. Begin adding the veggie stock, about a cup at a time, following the same process of continual stirring. Add some salt with the first round of stock. Meanwhile, heat some olive oil over high heat and add zucchini and garlic. Add salt and pepper to taste and cook until tender. Set aside. After about 30 minutes, when the rice is still slightly al dente but cooked through and the last bit of liquid is nearly absorbed, add a knob of butter, the cheese, juice squeezed from the half lemon, and stir furiously. Let it sit for a few minutes. Taste for seasoning and enjoy!